Hacienda chandeliers under Rustica House brand come in a variety of shapes, styles and sizes. In addition, the buyer can customize the chandelier by choosing finishing or having painted in custom color. Our ceiling light fixtures are handcrafted out of forged iron and tin in Mexico. 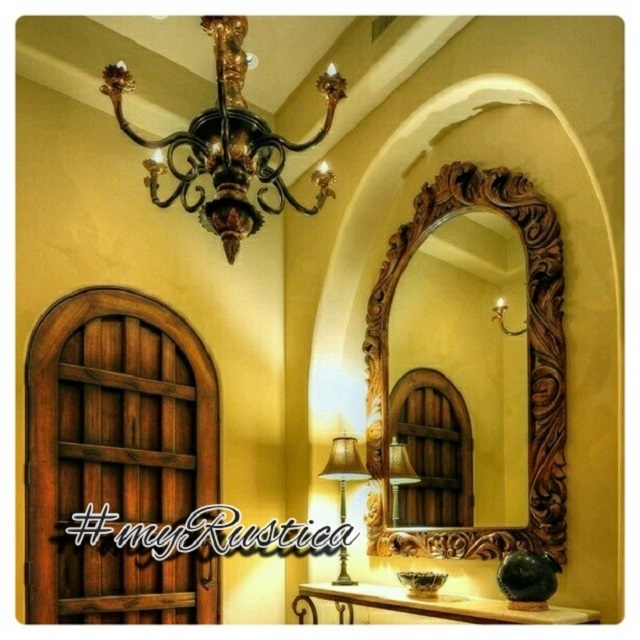 Many designs resemble old European past and Spanish style iron illumination home decor heritage. Rustica House hacienda chandeliers are offered in black iron, natural that is kind of industrial looking and rusted. We accelerate the process by using acids and then varnish the surface to prevent further oxidation. Also, it makes easier to maintain rustic and black iron chandeliers dust free. Chandelier models shown on the product page images might be demonstrating colors not included in the options. In such a case, it can be painted in that particular color at no extra cost. Our handcrafted hacienda chandeliers are produced as small, medium and large. Optionally, the buyer can order a custom ceiling lamp in any dimensions. Recommended diameter for large ceiling lighting is up to seven feet. Even though we can manufacture in Mexico much larger chandeliers, their delivery cost might be of concern. A large chandelier in hacienda style with the diameter made below eight feet can be transported on a double pallet making shipping abroad feasible.